After hearing people sing praises of Brother John Burger in Damansara Utama, I decided to try it for myself. The stall is manned by Abang John, often addressed as “bro” by his regulars. 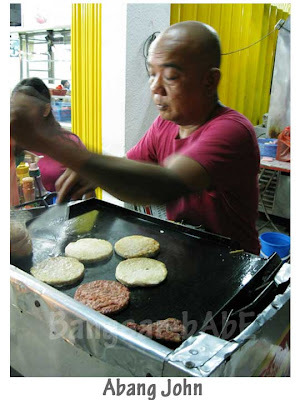 Abang John has been running his stall for 10 years and sells about 200+ burgers (including hotdogs) a day. He opens for business from 8.30pm till 3am. At 11.30pm, there was a queue and we had to wait 30 minutes for our burgers. Abang John was very nice and happily answered all my questions. He even showed me the brand of mayonnaise he uses, and didn’t mind me constantly taking pictures of him in action. =P I ordered the Ayam Special Cheese and Jeen had the Daging Special Cheese. rif was still full from dinner so he only wanted a few bites from my burger. 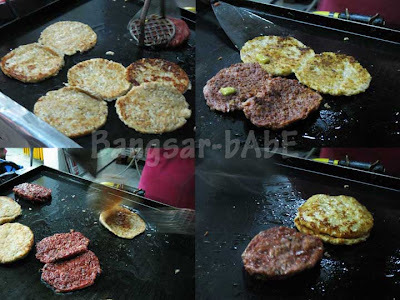 The patties are cooked “butterfly style”, and he adds a dash of chili powder, pepper and a squeeze of mustard before putting the patties back together. The egg is swirled on the grill, forming a crepe-like base. Chili powder, pepper and soy sauce is then added for flavour. 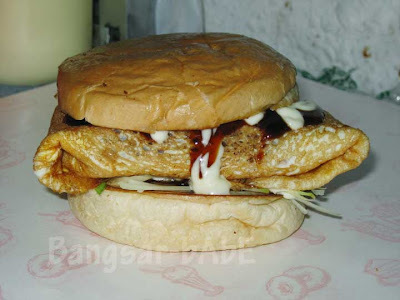 The seasoned patty is then placed on top of the egg base and topped with a slice of cheese. 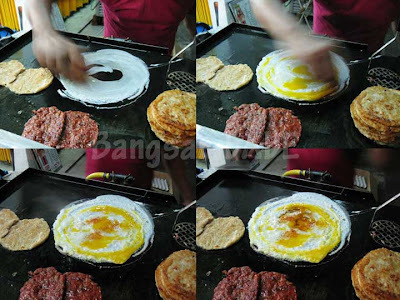 Abang John then folds the egg very neatly to seal in the flavours. 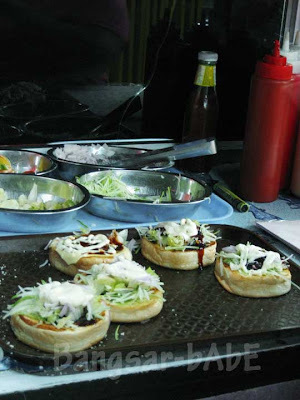 The slightly crisp bun base is first topped with shredded cucumber, lettuce, tomato slices and chopped onions. Followed by a generous squeeze of mayonnaise and BBQ sauce. 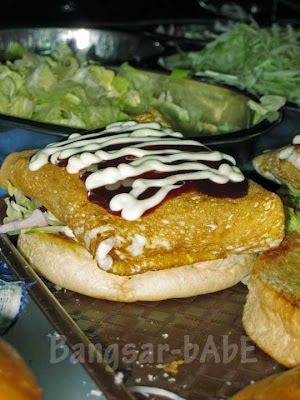 The extravagant patty is then placed on top and drizzled again with mayonnaise & BBQ sauce and topped with the bun top. Watching him prepare the burgers made me salivate in anticipation. Once mine was ready, I proceeded to eat it with gusto. Each bite was sublime. 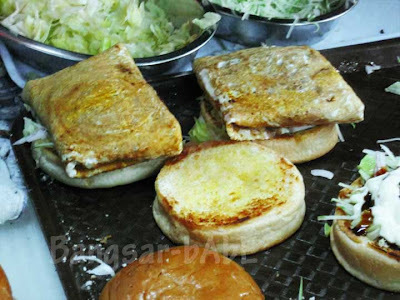 The egg-wrapped patty oozed melted cheese and the mustard gave a sweetish tang to the meat patty. Absolutely scrumptious with the BBQ mayo sauce combination! 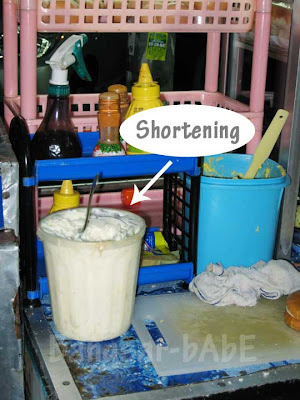 Abang John’s burgers are less greasy because he uses shortening instead of butter. Nonetheless, it is really sloppy, just the way a good Ramli burger should be. Verdict: Deliciously juicy, sloppy and full of flavour. What’s not to like? 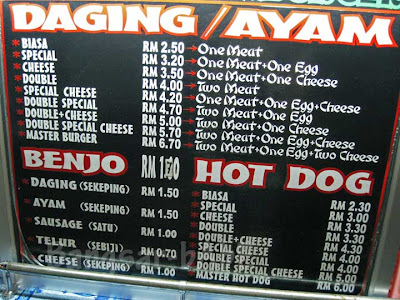 *Brother John Burger is located across the Uptown Hawker Centre, outside Restoran Bee Fatt. are you on a ramli burger spree??? can come up with a book d! 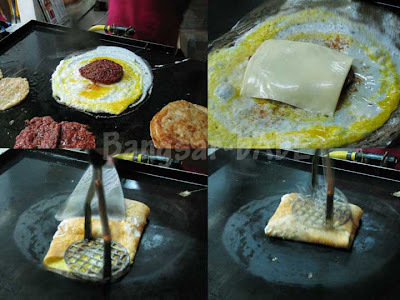 Special method of prepare Ramly burger!! Some special ingredients are used such as mustard, BBQ sauce & shortening!!! For the extra work on the egg wrap he deserves to sell 200+ a day. That’s good business. Lately I like to stock my freezer with some Ramly burgers for the hunger pangs. worldwindows – Ya, he makes really good money! 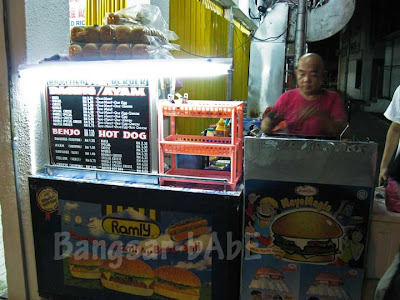 I have a newfound respect for ramli burgers….never knew the love that goes into making one…. Mmmm, yumm…now I have to stay back late to get my hands on one of these babies! I am seriously displaying some very uncouth behaviour here at work, looking at the making of that delicious burger! I swear I actually just drooled! 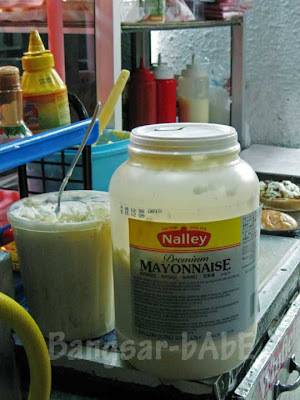 wah … with chilli powderm pepper and mayo-mustard sauce combo?!!! where’s this uptown hawker centre? J2Kfm – It’s in Damansara Utama…very nearby Fusion Restaurant. =) If you want, I can give you directions. I like the cheese melting picture, it makes me feel hungry again!!! Steven – It's located between Bee Fatt and CIMB Wealth Advisors in Damansara Utama. you are the connoisseur of burgers-i bestow you 5 stars. Oh man, these photos and descriptions are killing me! Anything “deliciously juicy, sloppy, and full of flavor” sounds like something I need to try immediately. Nice post! Thanks! This is one of the better Ramly burgers around. ohh…so this is the Abg Botak I heard abt! do u know abt the Friedchillies award thingy? I was goin to try them one by one but the list aint got addresses!I started w the Abg Om, since he’s the closet to my plc.. but was not open the night i went! argghh.. Same commercial Ramli patties..but the little extras of ingredients that mks the diff! BB – perhaps because i spent most of my college years there thus the preferential choice :)Used to work at DU for 3 years but had never tried Bro John..what a waste..
Wa you know DU food better than me eventho i stay ere 30+ years! Didnt know about this place. ..